Within the design process of combustion systems special attention should be given to the emission behavior and stability of the flame. 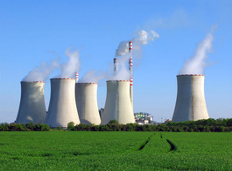 Especially the reduction of NOx emissions by application of the premixing technology represents a challenging task, since such a technology is often related with the appearance of combustion instabilities and oscillations that might lead to significant mechanical damage and hazard on humans and environment. Thus, it is of highest importance to analyze and understand emission and stability behavior of combustion systems at an early stage of the design process. B&B-AGEMA applies modern numerical methods to simulate and analyze combustion processes, taking into account complex interactions between mixing processes, chemical kinetics and flame dynamics. By application of a validated advanced in-house Code the oscillation behavior of gas turbine combustors can be predicted with highest accuracy, so that the so called "humming" phenomena can be detected and avoided within the design process. Such analyses can be supported by experimental investigations, which can be conducted in collaboration with our partners at Aachen University. On the gas turbine combustor test rig real operating conditions can be established with an air supply pressure up to 30 bar and air inlet temperature up to 550 °C.